Back From the Dead? or just Getting Older? 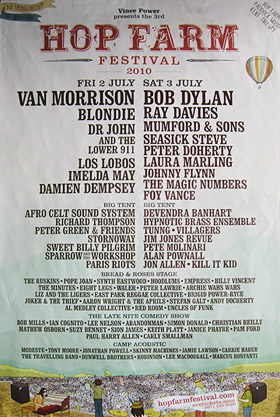 Last year while Jo was working in Britain she sent home this photo of the Hop Farm festival poster; we had a good laugh about what decade she had fallen back in time to. The other week while reading the May issue of the Stool Pigeon it was neat to see how many musicians, either reformed or still at it, were on this year’s summer concert bills. Alongside some of my favourite current musicians are a few from my past that I would love to see. Sometimes its ok for the past catch up with you. London’s 1-2-3-4 festival: billed along-side the Black Lips and The Ravonettes are Lydia Lunch and Can’s Damo Suzuki. Leicester’s Summer Sundae festival: billed along-side the Born Ruffians and Wolf People are John Cooper Clarke and an all-grown-up Shonen Knife. On the downside (time for a beer) so are Showaddywaddy. Suffolk’s Southwold Latitude festival: contemporaries Avi Buffalo, Bombay Bicycle Club and Glasser are lined up with Linton Kwesi Johnson and Edwyn Collins. Again on the downside (time for pee), so are The Waterboys. London’s Field Day: our own Connan Mockasin and the ever-so-groovy Omar Souleyman share the stage with John Cale and Faust. Coincidently, with Flying Nun Records celebrating their 30 birthday in November, it got me thinking about the stamina of some musicians; how glad I am that among the grey-beards and silver-shadows there are folk with an appetite for fresh and challenging music. Still. We recorded our own Flying Nun 12″ in 1984; Phantom Forth The eepp. Later in 1986 I co-released – as This Is Heaven the 7″ book/record 200 Variations – with Flying Nun and Industrial Tapes. Getting Older indeed. If you are unfamiliar with London’s independent newsprint, the Stool Pigeon, a sub is a bargain, or you can read/download at the issuu.com. This entry was posted in Music and tagged Bombay Bicycle Club, Damo Suzuki, Faust, Flying Nun 30th birthday, Hop Farm, John CaleBlack Lips, John Cooper Clarke, Linton Kwesi Johnson, Phantom Forth, The Clean, The Stool Pigeon, UK summer music festivals. Bookmark the permalink.